Imagine your Pastor standing behind the pulpit. All the lights are on, the microphone is working nicely, and the doors are unlocked so people can freely come in. He’s worked for hours on a great sermon that he knows many people will respond to. He clears his throat and delivers an eloquent message. Except it’s an empty room. It doesn’t make sense does it! No one would waste their time in preparation to have their words wasted in an empty room. Would it be better if there were 2 people present? How about 12? Every person or organization has to determine what makes sense. Often, church communicators spend entire weeks preparing materials (design, pictures, illustrations, words, etc.) only to have no one show up and consume their content. 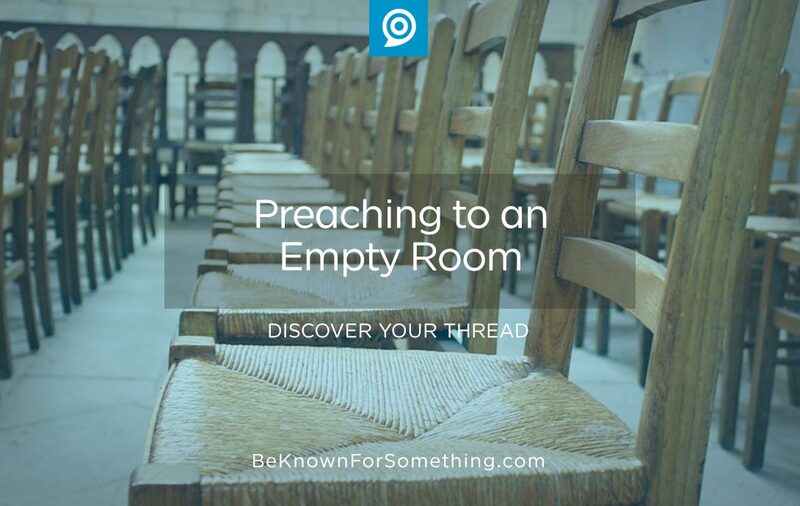 It’s as silly as a Pastor speaking to an empty room (or an almost empty room). Social Media. Many churches have social media accounts with very few followers. It quite possibly would be better if a church volunteer simply called the few people with the message. Solution: Get more followers every way possible. Give your congregation a reason to follow your social media. Remind them constantly. Use ad tools to engage with your community and get more followers. Can’t get them engaged? Either your content isn’t good or your audience isn’t interested. Stop wasting your time. Website Pages. Every good Pastor knows he needs to stop talking before his congregation stops listening. Sadly, churches are creating website content that very few are reading. Most people only stay on a webpage for about 10 seconds consuming about 50 words. If a page contains much more than that, people are less likely to read ANY words. Solution: People want to graze on a website, so create scannable content that is easy to understand/remember as someone glances down a page. Concentrate on the headline, captions, and bullet points. Edit. Edit. Edit. Bulletins. A small study that we conducted (in a blended adult ministry in a large church) showed that 2/3 of adults aren’t regularly reading the worship guide for announcements. Most use it as a bookmark for the week and then throw it away. Solution: Reduce your bulletin to the smallest printed piece possible. More people will consume a page with a few announcements than reading through several pages. Use scannable content to drive people to your website. Make sure that MOST of your information is centralized on your website so people know where to find it (instead of not knowing where their bulletin is). Let’s get your church communications done properly so you engage your community and fill the pews each week. Your Pastor will thank you.